Remove and discard the woody bottom ends of the asparagus. Cut off asparagus heads and add to a large bowl. Shave asparagus stems, quarter tomatoes, and add both to the bowl. Sprinkle with sugar and salt and mix to combine. Let sit for approx. 5 min. Add raspberry vinegar, walnut oil, and vegetable oil. Mix together and set salad aside. Warm a frying pan over medium-low heat. Chop walnuts and toast them in the frying pan. Afterwards, remove the pan from the heat and let cool. 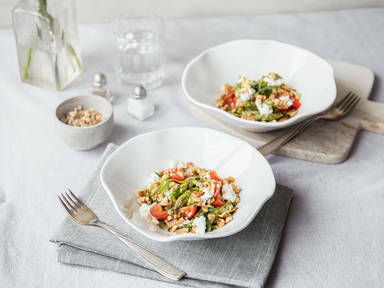 Serve asparagus salad on a table and crumble the goat cheese over the top. Garnish with freshly grated lemon zest and tarragon leaves. Top with toasted walnuts and enjoy!